Some years later and with the launch of Nintendo’s Switch, what better platform to port this RPG-Builder to and explore it for the first time. Especially as Dragon Quest is one JRPG that holds a bright candle in our hearts. Set after the events of the original Dragon Quest, Builders takes us through an alternate timeline in the long since destroyed Alefgard in which the few left no longer have the ability to build or create. A simple enough premise giving you enough of a jumping off point to begin your immersion into the world but one which requires essentially no prior knowledge of the previous entries to understand or even fall in love with the games style, enemies and overall shot of nostalgia with its classic Zelda feels. After a fairly thorough tutorial, giving you all the know how you need to get building, from full on structures to surviving in the harsh wilderness of Alefgard (hot tip, don’t stray too far from a light source when the night falls) Dragon Quest Builders takes the training wheels off and leaves you to build as you see fit. 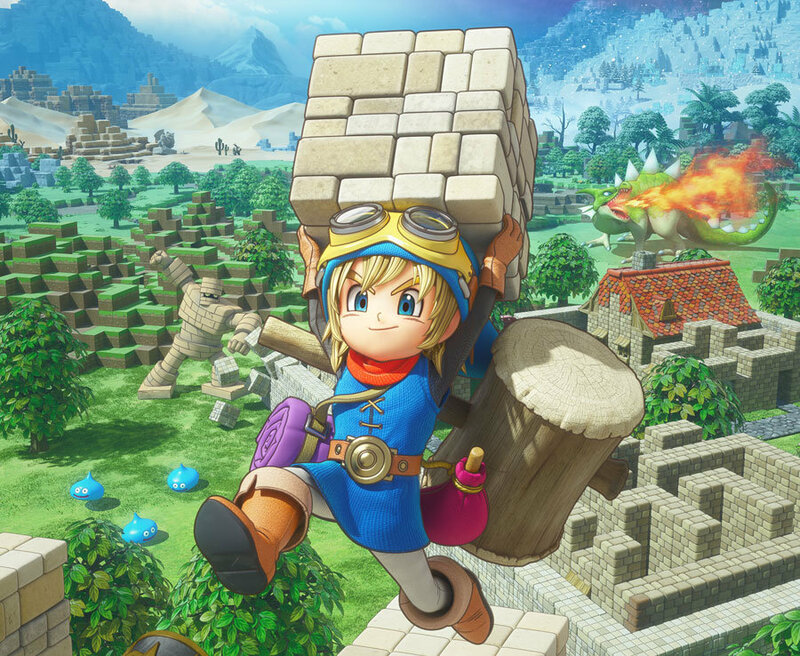 In DRAGON QUEST BUILDERS, players are tasked to construct a wide variety of structures as they receive ever-more extravagant requests from expectant citizens eager to find a new home. Explore with the freedom of sandbox gameplay, combined with an immersive and charming DRAGON QUEST story – battling with iconic DRAGON QUEST monsters and interacting with gorgeously designed 3D characters along the way. Thankfully building is simple enough to understand but expansive enough for you to let your imagination run away with you, creating towns of your own. It’s a hugely satisfying experience, especially when your creations can be built, upgraded and even taken down again with simple commands that feel natural to control. There are story-based mission of course, as towns folk will need a hand from time to time building anything from simple bedrooms to bathhouses and even wandering the more dangerous parts of the world in search of precious materials and possible new towns-folk. Simplicity is at the games core though as combat is just as easy to adopt as the main building mechanic, opting for a classic Zelda-esque real-time combat system which is much pacier than the series turn based combat and fits extremely well with the over feel of this iteration. And while the world here may seem a little different for experienced Dragon Quest fans there are plenty of familiar monsters to deal with; from metal-slime to golems, which appear the further, you delve into the wilderness. Each dropping crucial building materials. Exploring while treacherous is seldom a waste of time, as all areas of the world from it’s deserts to it’s forests have plenty of secrets to distract you and give you yet another reason to stray from your quest and sink some more time into. Perhaps the most interesting aspect we found, however, was the many sieges you’ll encounter once you’ve progressed a little further into your adventure. As an array of the games nasty’s tear towards all four walls of your towns, you’ll need to prepare barriers and automated defences to survive the onslaught. These miniaturised tower defence moments are fun and challenging without entering into hair pulling territory. Dragon Quest Builders is a big game disguised in a simple package, and one that fits perfectly with the Switch. We found ourselves constantly dipping in and out on train journeys before docking at home for longer sessions, delightfully hooked on the games world and that niggling need to spend 5 more minutes building the next addition to our towns. Whether you’re new to Dragon Quest or this style of creation based game, you’re sure to be fully enthralled.